Thank you so much! Fog makes everything look mysterious. Stunning photos, the one of the sun rise fron St. John’s Hill is beautiful. How sad that your solo visits to Kilsheenan Woods have had to stop. Whether it’s a sign of the times or something we (or the media) notice more nowadays, I don’t know. But such crimes seem to be on the increase in so many areas. A lovely ‘dream post’, Inese. Thank you! I hope these two criminals get caught and we will enjoy our trips again. Pink sun shining through the fog is really beautiful. By the way, I also like reading news. It’s hard sometimes, but one should keep with the world, even if it,s foggy. It’s getting even more foggy in Poland this days. Sometimes also interesting: a time to show hidden emotions. By the way- i don’t believe it. 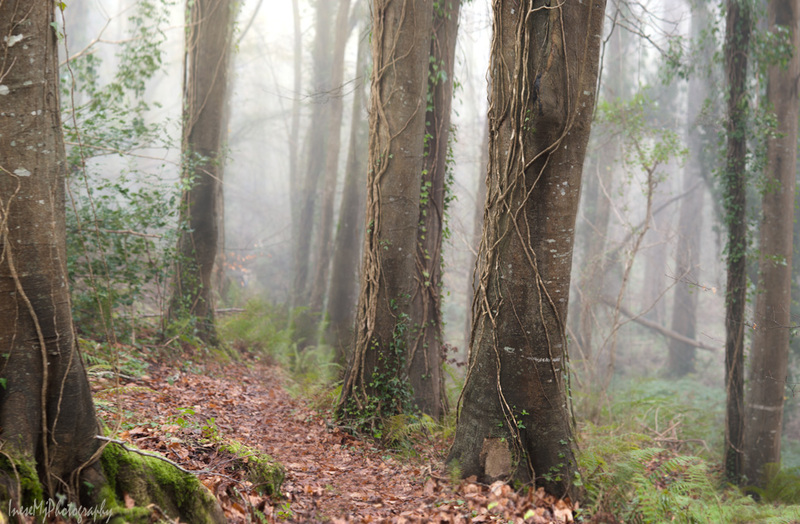 Is it really so dangerous to walk in forest in Ireland? Who is so dangerous in there? Isn’t the fog beautiful? But it can be dangerous when driving. By the way, I don’t exactly know about forest, but driving country roads is dangerous lately. Two men who speak English with an accent, are robbing and beating women-drivers on the country roads, using different strategies to get the women out of their cars. As you know, photographers are carrying equipment worth thousands, and it is easy to figure out where they might go for a shoot. The last robbery was reported from a scenic coastal road. You might be right 🙂 And thank you again for your lovely comment! The mystery the fog brings to any day is always kind of fun (weather and light working together is a photographer’s dream)…and you show how great it can be to capture the feel. A bit mysterious and bold at the same time. My favorite shot, easily is of the two Mormon missionaries…I’ve known many and you’ve captured their spirits with this shot. Wonderful works again ~ wish you well. Thank you Randall! These two young ladies are so inspiring. Regardless of the weather they are out in the streets. I know that they have sacrificed their time and money to serve their mission. Amazing faith, and always in the crosshairs of hate. Thank you again! Wishing you a wonderful week! Very good images Inese! 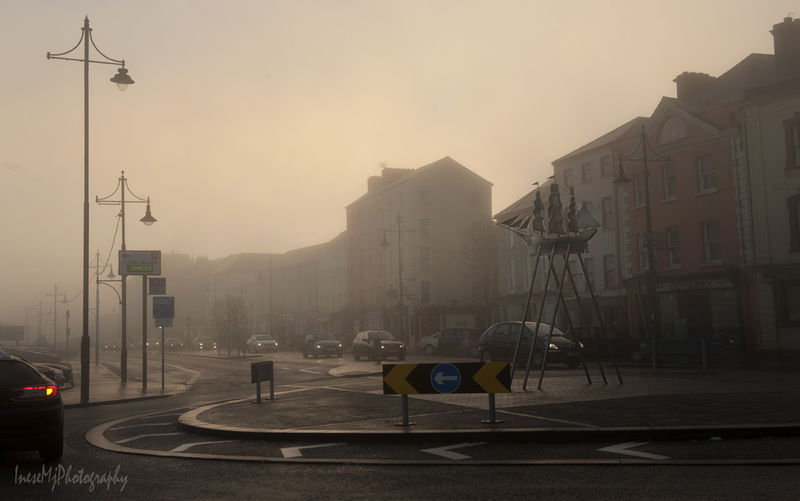 Fog is something I’ve not seen much, and it’s great subject matter as your images clearly demonstrate. Thank you, Maria! 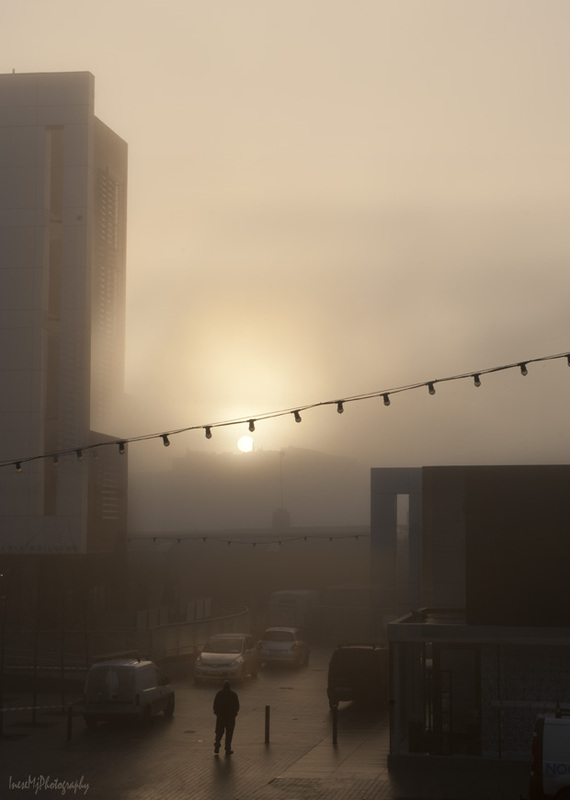 Fog changes everything in the scene. Not easy to capture though, it can make the images grainy. 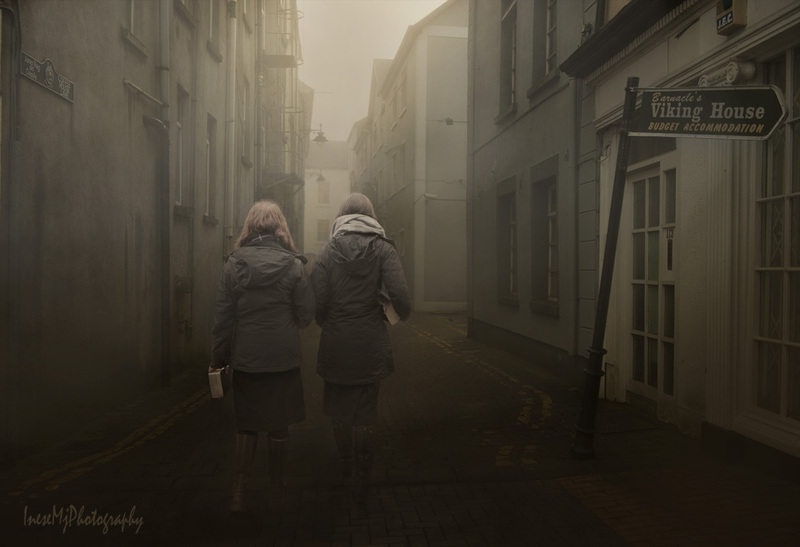 I love the magic and mystery of fog Inese and you’ve certainly captured that with these images. Great fog pictures. Fog is something I respect thoroughly. My compliments on your blog. I’ve never been to Tipperary, nor met anyone from there so I will come back once in a while. Thank you for your comment, Brian. Comments are closed because of the incredible amount of the worst kind of spam I was getting on my older posts. Sometimes I am posting photographs of children, and I don’t want this sick linking to my blog. These foxes were dying when Pat took them in his care. They cannot survive in the wild anymore, unless they undergo a long period of transition supervised by wild animal specialists. Let them go free, and they will likely get killed by their own species. They smell of humans. Thank you again for stopping by and following this blog. (No worry about comments) I browsed my shelves for that book I read long ago. Couldn’t find it. Probably stored in a bix in France. Joy Adamson in Born free did show that it takes a lot of effort and (re)training to train lions (or others) back to the wild. I’m glad those little ones were rescued. Will check your other fox posts. Cheers. I grew up with the Joy Adamson’s books. She is responsible for my bad choice of profession – veterinary wasn’t my calling after all. Putting animals down is a tough thing to do. Had’t thought about that. But you are right it must be a heartbreak every time. Just saw your other posts. Lovely. Particularly like their “body language”, the one standing on Paddy’s shoulders to get a better view. Are their pupils like cats’? Yes, they have vertical slit pupils. I have to visit Pat again, just waiting for a better weather. Thank you Olga! Yes, no sunrise photography for me anymore. Congratulations again! Hi Ines, Great sentiment and beautiful images! I really enjoyed all of these mystical photos of the fog, Inese — espec. the first one. Thank you! It is a second time I got a peach sunrise this winter. Some day I will post the other set of pictures. You are a gifted photographer. Very interesting images. It’s wonderful how much romance and interest a bit of fog can bring to a picture. I don’t blame you for avoiding wandering about by yourself in the woods if there has been trouble recently, though. Oh I so agree with you, being a fog addict myself ( only a fire would get me out of bed that early). Yes, it is terrible, just read about another case. This time they put a blinker on the car roof and tried to make a lady driver to pull over. That’s awful. I hope they catch whoever is doing it soon. Beautiful pictures – I especially love the one before the quote! 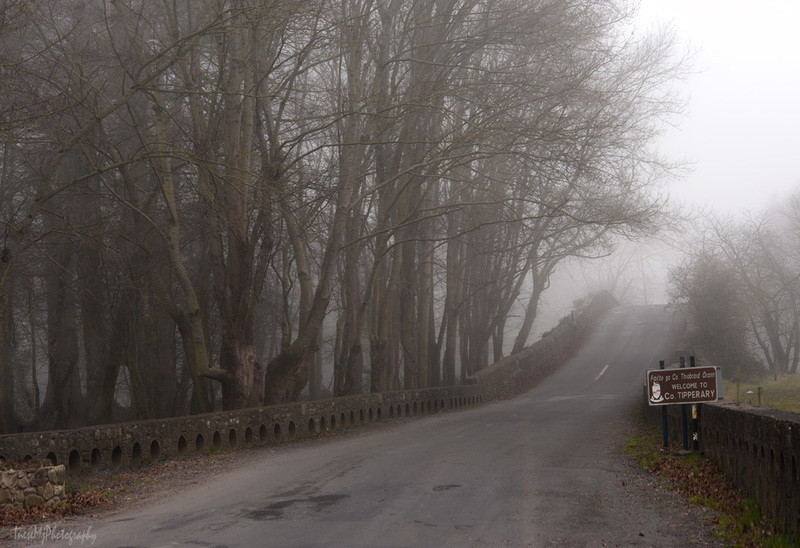 I love the way you began with the beautiful photos of fog, inspired by a dream. I like the way the bare branches seem to create layers of silhouettes. Then you cast the literal fog over our perceptions, the distortions when we can’t or refuse to see with clarity. A lovely layered post, Inese. Thank you so much for your comment! It is so true what you are saying. People’s judgment can be easily affected by distortions, especially when they are skilfully orchestrated. Very neat fog photos! Fog is like a dream. People getting robbed & beaten in the countryside? Why is this happening? Thank you so much Resa! Yes, a few incidents, one after another, two males are watching for a female driver, then pretend that she knocked someone over. She gets out of her car and… Police is investigating, but there is very little chance to catch them. They choose narrow country roads and early hours. The last incident happened on a very scenic road used by most of seascape photographers. This post is an interesting melange of your thoughts and pictures. Outstanding fog pictures. Fog is immense here that you can’t view anything. Beautiful but dangerous, isn’t it. Thank you for stopping by! Lovely photos. You’ve caught the fading depth and muted light brilliantly. I really love the one with the missionaries in the narrow street. Thank you so much! That was a fog harvest day indeed 🙂 The peach morning pictures were taken a couple of hours earlier the same day. You did it again Inese! :) The most beautiful fog pictures I have ever seen! I especially like the first and second one for the true romantic look – reminds me very much of Caspar David Friedrich! The picture with the bridge is realy eerie and the sixth picture is absolutely stunning! You create so much atmosphere with your pictures. Thank you for you kind comment, Sarah! I am happy that you and your mother are close friends. You need each other. Absolutely agree with you about the news. Avoiding reality is not a good tactic, and being prepared increases our chances of staying safe. I’ve always loved fog photos and yours are really fantastic! Those are brilliant photographs Inese. Very atmospheric. I suspect the amateur psychologists among us would say your dream indicates certain questions in your life for which you seek answers despite some barriers while knowing you’ll get the answers in the end because you’ll take the right path. Thank you so much for your kind comment, John! You did a very great job with the photos. I love the quote at the end. Thank you for sharing. Thank you so much for your comment! This is a very inspiring quote indeed. Your deep connection with your daughter is wonderful, Inese. I am so glad that you see the positive in the “voices” or “faces” of little ones with special disabilities due to the Zika virus-carrying mosquitoes. You are so ♡ wonderful to think about these children and how challenging their lives will be, if they live. . . . Poor sweet babies. Did you click the link to the Hooligans blog? I beg you do, it is a very inspiring and humbling read. It is a new photograph, so I didn’t get any reaction yet. I spoke about the Mormon Church. After Mitt Romney’s run for president, I noticed that the media turned against the church as never before. It is a very sad sign. 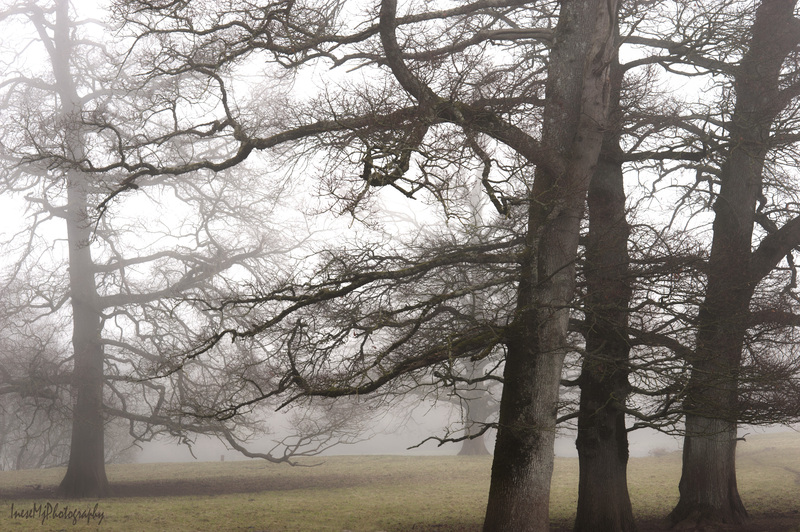 There’s something eerie and mysterious about the fog that you’ve captured so well in your photos. I believe that we are living in the times of a thick fog of uncertainty, where the way forward seems unfamiliar, insecure, and dangerous, as you described in your dream. Thank you so much Rosaliene! Fear is a tool of control. If a politician uses word ‘fear’ too often, be aware. I rather listen to those who say ‘Fear not’ 🙂 Especially in these insecure, uncertain times, as you say. 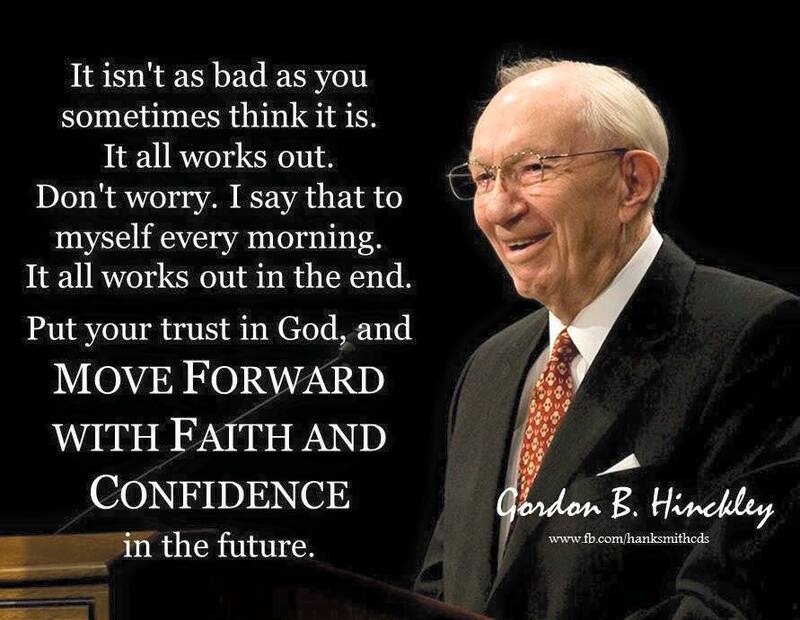 It is why I love this quote of Gordon B Hinckley. Thank you Sheldon! President Hinckley was a wise man indeed. Great photos! I’ve tried once or twice to take pictures of fog, and they never turn out quite the way I want. I’ll get one yet. Thank you so much! Glad you like the pictures! A thoughtful and lovely post Inese. Stunning images threaded through important ideas. I, too, have dreams where I am driving in a terrible fog (or snowstorm) and cannot see where I am going, even as I continue on. So far, it hasn’t resulted in a catastrophe before I wake up! Thank you so much, Cynthia! Nothing happened with me too, I was focused on staying on the road, and there was no panic or anything, a very realistic dream. Fog is somehow magical or creates mystery. The tree picture that you took the test shot is just that. It looks like in a story land. It is too bad that the place is less safe for people to enjoy it as before. Sadly, that crimes seem to be every where. Thank you so much for your comment! Yes, it is not safe to walk alone anymore. As a kid, I walked to visit my grandmother through the woods, a quarry, across the railway and highway, about 8-9 km. It took me a few hours with all the stops. Nowadays, I doubt that a grown up man would walk there on his own. That sounds like fun walking during those time. I recalled walking a long distance when I was younger even there were buses but I just wanted to walk so that I can see things. I really like the images with the fog. It creates a wonderful effect. Nice work. Cheers! Thank you! Check out that blog I mentioned. Amazing family. Beautiful! Enjoy more at inesemjphotography.com. Thank you so much for your comment! The fog horns! Yes! The sounds are struggling through the fog the same as the light. The beasts can fly up to 10 km. All depends on what temperature they need to carry on their life cycle. Good analogy – news and fog. It’s a shame people think Romney is typical of Mormons – he really isn’t! Thank you Jan! I don’t think that there is something wrong with the Mormons too 🙂 Speaking of Romney – to be honest, I don’t know much about his campaign, but I know one thing that is always true – people who are able to run their family well, can run the country 😉 I think the US needs not a party but a person for president. A leader. Thank you so much for your comment, Teagan! I wish I were in fine form to answer the question in your blog. Sitting and staring at the picture, and the only smell I feel is the smell of a fried fish someone is cooking for their lunch! I will go back and start all over again 🙂 Many hugs!!! I think that is perfect, Inese! Besides, you said something different. So many of the comments were either bread or rain, or both. Fried fish is a very evocative aroma. It reminds me of “fish fries” my grand parents would have, inviting a dozen people if my grandfather caught a lot of fish. More hugs! Ok, if you don’t mind the fish, I will go and write the comment 🙂 More huge hugs!